Unwanted body hair can be a huge problem for both men and women, and finding a removal method that is convenient, simple and yet also effective is never as easy as it seems. While going to a salon for a professional hair removal treatment might be the ideal option, it’s also an expensive one. With financial times being tough, it comes as no surprise that more people than ever before are looking increasingly for ways to get professional hair removal results in the comfort of their own home at a fraction of the cost. Why Is Electrolysis So Popular? When it comes to removing hair, there are several options, but only one is permanent. Shaving, waxing, epilating or even laser treatments are only temporary measures, and although laser treatment is the most effective of these, the hair will eventually grow back to some extent. Electrolysis is the only permanent solution to hair removal. While electrolysis was once something that could only be done by a professional in a salon or cosmetic surgeon’s office, these days there are now DIY kits on the market which promise an affordable and simple alternative to the expense and hassle of going to a professional for a treatment. One of the reasons why electrolysis is so popular is that it permanently removes the hair so there is no longer any need to remove the hair and no more painful ingrowing hairs. It is a painless method of hair removal when compared to many other options such as threading, epilating and waxing. How Does Home Electrolysis Work? All home electrolysis devices are different. The best ones have a galvanic probe which is slid into the follicle without burning or piercing the skin. Then, a quick pulse of electricity kills the hair, which is then removed with standard tweezers. 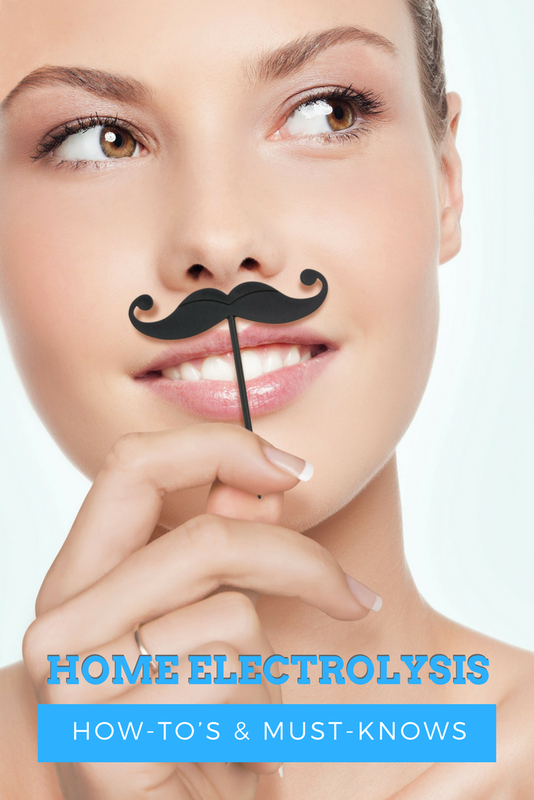 What Are The Advantages Of Home Electrolysis? Especially effective for hair removal over small areas. If you buy the wrong kind of DIY electrolysis kit you won’t necessarily produce the desired result. It can be difficult to learn how to use the kit properly and it will take some time to practice before you can achieve the results you want to see. It takes a long time to carry out home electrolysis on even a small area of skin. This is by no means a quick fix. The main problem with home electrolysis is that it can include some dangers. If it is carried out incorrectly, and the needle is accidentally inserted into the root of the hair, it can kill the area above the hair. This can result in new hair growing under the skin and lead to scarring and infections. Should I Try Home Electrolysis? For some people, home electrolysis is the ideal solution to their hair removal problems, especially if they only have a small area of hair to remove, if they live a long way from a salon or if they need a low cost option for hair removal. As long as you invest in a good quality kit and take the necessary time to learn how to use it properly, you will often find that you achieve very good results that last a lifetime. However, if you are worried at all about accidentally getting it wrong and causing your skin some damage, or if you have very large areas of hair that you wish to remove, it is best to seek professional treatment in a salon so you can be guaranteed the result you want. Which Are The Best Home Electrolysis Kits? This high quality probe electrolysis kit has a one year manufacturer’s warranty and operates with a 9V battery. Once you have found the right depth and angle for the probe, it will effectively kill the hair leading to permanent removal, although some people have found that the probe is a little too short and they experienced some irritation afterwards. This device can be used to remove hair on any area of the body, and the probe has been designed in such a way that it will never be able to pierce the skin for better user safety. It is even safe for use on sensitive areas such as the bikini line. With its incredibly low price tag, it’s easy to see why this device is so popular. If you’re looking for a seriously impressive professional standard kit to use at home, the Electrolyse Automatique system is protected by a one year manufacturer’s warranty and operates using a foot switch for extra convenience. It comes with 5 sterile disposable probes for the best sanitation and it features the professional style probe which would be used in a salon. This machine is packed with features when compared with other kits that are designed for home use and while it can be tricky to learn how to use this kit properly, the results that it produces are very good thanks to the extra power that this kit generates. It is also designed to minimize discomfort as the kit is fully programmable to accommodate different times and settings to suit the needs of hair on different parts of the body. We’ve got all your body care needs covered with guides to the best epilators, depilatory creams, electric shavers, and much more! The best place to find links to all our helpful content is our homepage.